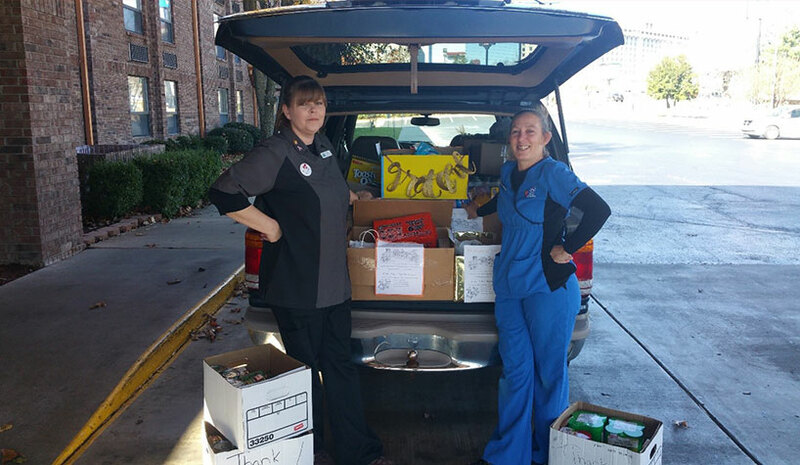 Myer Hotels volunteers participate in a food drive. BRANSON, MO—Giving back is part of the culture at Myer Hotels, based here. One of the many organizations the company supports is Christian Action Ministries, a local nonprofit dedicated to helping people who are less fortunate. With a little friendly competition, everyone wins. It also helped to mobilize volunteers to participate in the volunteerism project. In addition, at each hotel property, the managers would put up flyers and place boxes in the team member areas and also behind the front desk to encourage staff members participate. In hospitality, there’s an attitude of service and a focus on the needs of others. At Myer Hotels, the philanthropic culture is going strong. According to Myer, it enables them to become more aware of what needs exist within their community. “It is always a blessing to be able to bless others through our company’s efforts. Our company is able to participate in a variety of things to help give back to the community. We participate in Relay for Life each year to raise funds for the American Cancer Society, as cancer affects so many different families and, at times, staff. This event allows numerous people to rally behind and encourage others,” he said. “We also sponsor a night volunteering for Loaves and Fishes, a winter program for people who need help with meals during the off-season. As a company, we tend to be more low-key in our philanthropic approach,” Myer said, noting that the company doesn’t broadcast its efforts for recognition.